Home Life What Harms and Disadvantages Can Smoking Cause? Cigarette smoking is responsible for one out of every five deaths in the US, according to the Centers for Disease Control and Prevention (CDC). Unfortunately, even after warnings from friends and loved ones, negative advertisements about smoking on TV, and the advice of the doctor, some people start smoking and later find it is difficult to quit. Anyhow, you need to know smoking cigarettes is dangerous to you as well as people around you and there are many disadvantages of smoking. Like affecting your lungs, all organs of the body can be affected by cigarette smoking. There are many ingredients in tobacco that are chemically active. In fact, there are more than 4,000 active chemicals in cigarette smoke that can lead to serious and sometimes fatal changes inside the body. Some of these ingredients include carbon monoxide, tar, hydrogen cyanide, nitrogen oxides, ammonia, metal substances, and radioactive compounds that can do you serious harm. Research has shown that many different chemicals in cigarettes can result in damage to the macula of the eye, which is the most sensitive aspect of the retina. There can be small blood vessels bursting through the macula, leading to the damage that is often irreversible. Smoking also results in structural and functional changes in the lens of the eye and in the retina, because it causes atherosclerotic plaques that can lead to thrombosis and eye damage from the capillaries of the eye. Smoking is a known risk factor for all types of digestive cancers, such as cancer of the mouth, larynx and esophagus. People who smoke have 20-30 times the risk of death due to laryngeal cancer when compared to non-smokers. This is just some of the disadvantages of smoking. Smoking can also cause a variety of GI diseases, including peptic ulcers, heartburn, gallstones, Crohn's disease, and stomach cancer. Smoking affects the circulation and the heart function by causing two main things: 1) it markedly increases the blood pressure; 2) it causes an increase in the heart rate. This effect occurs because the nicotine in cigarettes directly affects the nerves, resulting in an increase in heart rate and constriction of the blood vessels. Because smokers have lungs full of toxic fumes, the heart needs to pump much harder to get the oxygen to the entire body. Smoking also causes an increase in blood cholesterol and the levels of fibrinogen in the blood. These lead to cardiovascular diseases, such as an aneurysm, coronary artery disease, stroke, and peripheral vascular disease. It is primarily the tar in cigarette smoke that does the most damage to the cells within the lungs. This can lead to cancer of the larynx or cancer of the lungs. It can also lead to chronic obstructive pulmonary disease, emphysema, and chronic bronchitis. There are several factors that can affect cigarette smoke's contribution to cancer of the lungs. These include the length of time the person has smoked, the daily amount of cigarette smoking, and the type of tobacco being ingested. This is surely one of the biggest disadvantages of smoking. Here is a video that shows you directly the damages of smoking to many organs. Smoking causes a buildup of cholesterol and other fatty types of plaques within the carotid artery leading to the brain. When a blood clot forms in the area of these plaques, a stroke can develop. Other things that tobacco smoke does to the damage of the brain include the decrease of the amount of oxygen that hemoglobin can carry to the brain cells because of carbon monoxide, the rise in blood pressure from excess nicotine, and a thickening of the blood that increases the risk of clotted blood. Smoking causes damage to the smokers' skin by reducing the amount of collagen in it. Collagen is what gives the skin its elasticity. Smokers eventually get very deep wrinkles in the skin of their faces because the nicotine adversely affects the skin capillaries which is necessary to keep it nourished. In addition, people that smoke run an increased risk of developing premature graying and thinning of their hair. 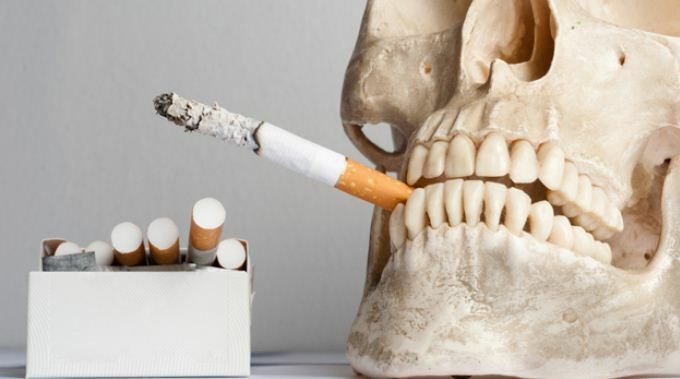 The chemicals that make up tobacco smoke are poisonous and can interfere with the growth and development of tissue cells of the muscle and bones. The various tissues of the body in smokers can't get adequate amount of blood supply so that it heals poorly. This means that smokers put themselves at a higher risk of osteoporosis. This is one of the devastating disadvantages of smoking. Smoking is a known cause of infertility and decreases the chances of fertilizing the egg in both men and women. Men who are smokers have a reduction in total sperm count and have a reduction in the ability to fertilize the female egg. Smoking also lessens the ability of the female ovary to make eggs that are healthy enough for fertilization. If you smoke and are also pregnant, you are more likely than non-smokers to have a preterm baby or a low birth weight baby. About 20-30 percent of babies who are born with a low birth weight and 14 percent of births that are preterm are caused by smoking during pregnancy. What's more, once born, the infant born to a mother who has smoked during pregnancy has an increased risk of reduced lung function and asthma. It turns out that nearly half of all cases of bladder and renal cancer are the result of cigarette smoking. Smoking not only damages your health, but it is a very expensive habit. An individual who smokes only a pack a day for 20 years will smoke about 7305 packs of cigarettes at a cost of more than $21,915. Smoking, according to the American Lung Association, results in total costs in the US of about $193 billion, which includes about $97 billion USD in lost work productivity and $96 billion USD in direct costs for health care. When you smoke, you do not just harm yourself. There is also the issue of passive smoking, which consists of breathing in tobacco smoke from those who are smoking around you. According to the Centers for Disease Control and Prevention, about 90 percent of people who do not smoke are exposed to secondhand cigarette smoke or environmental smoke. This type of exposure doubles the chances of developing a heart attack as well as other cardiovascular diseases and death from these diseases for a non-smoker. It can affect the appetite of growing children, causing stunting of their growth and an increase of smoking in teenagers. This is one of the most disheartening disadvantages of smoking.